Skiathos is one of the most popular islands in Greece, famous for its amazing sandy beaches and vivid nightlife. Skiathos hotels vary from traditionally built apartments and guesthouses to large hotels with luxurious facilities. Agia Paraskevi, Vromolimnos, Vassilias, Megali Ammos and Koukounaries are some of the most popular beaches in Skiathos, well-organized with many tourist activities and a variety of boutique hotels and upscale studios, as well as family hotels and traditional studios. More Skiathos hotels are also found along all the beaches on the southern side of this island of Sporades. Have a look at the hotels in Skiathos that we suggest and feel free to contact directly any accommodation through their booking form to ask a question or make a reservation. Many hotels in Skiathos also have online booking engines to make your reservation quickly and easily. As we take no commission from any bookings made via our website, prices are cheaper. Before making your reservation, check for available offers and last minute deals. Nice and convenient hotels in Skiathos are found at the beaches close to Skiathos Town, such as Megali Ammos, Ftelia, Vassilias and Ahladies. These accommodations give easy access to the beach, taverns and frequent bus connection to the town, which is the centre of nightlife on the island. Many Skiathos hotels are also found in long-distance beaches, like Koukounaries, ideal for total relaxation. Built directly on the beach, Skiathos Princess Hotel in Skiathos helps guests completely unwind through a variety of special treatments and sumptuous facilities. Its superior or maisonette rooms and lavish suites are surrounded by amazing gardens and are beautifully appointed up to the latest standard. All units feature basic conveniences, such as free wi-fi and TV, and luxury amenities, e.g. bathrobes, toiletries, slippers and signature mattresses. The elegant and comfortable complex of Aegean Suites is found in the area of Megali Ammos in Skiathos. The complex provides plenty of facilities such as a spa center, a gym and restaurants. All suites are tastefully and modernly decorated and offer great sea view from the balcony. Guests can find a private bathroom, a living room and modern facilities such as satellite TV, Wi-Fi and CD player. Skiathos Garden Cottages is a complex of autonomous cottages, situated on a lush green hill and overlooking the sandy beach of Megali Ammos. The complex offers a swimming pool, a children's pool, and an outdoors Jacuzzi. There is also a poolside bar. The cottages are stylishly decorated with contemporary furnishings and bright pops of colors. All units offer a comfortable lounge area, a fully equipped kitchen, and private furnished balconies with incredible views to the ocean. Each cottage also has its own barbeque facilities and private parking space. 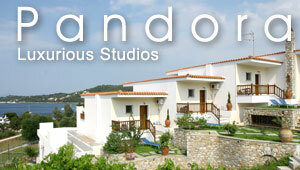 Mandraki Village in Skiathos is nicely located in the beautiful Koukounaries. The beach is at a short walking distance. This unique idyllic spot between lush woods and the deep blue of the Aegean was the setting for the Hollywood musical Mamma Mia, while the cast was staying in Mandraki village. All suites and rooms are elegantly decorated and furnished with eco-friendly materials, comfortable beds and sofas, and a wide range of modern amenities. Some of them include a flat screen TV, slippers, wi-fi access, KORRES bath products and hydro massage jet showers. Filled with beautiful, lush vegetation and encircled by crystal-clear, cobalt waters, Skiathos Island provides the ideal setting for dreamlike vacations. Bourtzi Boutique Hotel can be found on this amazing island in a very central and practical spot of Skiathos Town. It offers 38 sumptuous and lavish rooms, promising the most convenient and pleasurable stay. Also, it provides a lovely swimming pool with lots of sunbeds by the side. Situated at the very centre of Skiathos Town, La Piscine Art Hotel offers superb accommodation for all types of travellers. The hotel’s delightful design has been awarded by Trivago for its uniqueness. Its fully refurbished rooms and suites are elegantly decorated and well appointed with modern features, such as LCD TV, wi-fi, toiletries, hairdryer, Coco-mat mattresses and linen etc. La Piscine Art Hotel in Skiathos includes fine dining options and many recreational facilities, such as hiking, scuba diving and other sports. Kivo Hotel and Suites is a luxurious art hotel situated on a green hillside and overlooking the beach of Vassilias. The hotel has its own private beach, as well as a swimming pool and a children’s pool. There is a poolside bar, an indoors bar, two restaurants, and a breakfast buffet available each morning. The rooms and suites of the hotel are elegantly decorated with Greek and French inspired furnishings, flat-screen TV, mini bar, all-natural orthopedic mattresses, and private balcony with sea view. Some units also feature private pool. Found on a hill above Koukounaries Bay, Skiathos Palace Hotel in Skiathos offers a stunning panorama of the deep blue sea. The hotel provides standard and luxury rooms and suites in a tranquil setting of pine trees and nice sandy beaches. All rooms are well-equipped with modern amenities, e.g. TV, wi-fi, A/C, toiletries and hairdryer, and have a large balcony. Skiathos Palace boasts several facilities, including a spacious outdoor pool, bar, restaurant, business meeting rooms and sports courts.